Next Monday night, on July 27th at 7 pm, I’m going to share a short presentation at the monthly OKC area WordPress User’s Group meeting. This is a free meetup at Oklahoma Christian University the last Monday of each month. The title of my presentation will be, “Podcasting Options with WordPress.” In addition to discussing the benefits of podcasting, podcasting workflows, and apps which make podcasting much easier (Opinion and Spreaker) I’ll highlight the benefits of three WordPress plugins for podcasting: PodLove Player, Blubrry PowerPress, and PodLove Publisher. I’ll highlight why I now host most of my podcasts on Amazon S3: It’s so much cheaper than all the alternatives! I will also briefly discuss the benefits of normalizing podcast audio using a service or app like Auphonic. Here are the slides I plan to use for the presentation. I’ve shared these as a Google Presentation, so many of the icons/images on the slides are “live links” to corresponding web resources and apps. If there are other concepts or WordPress plugins you think I should address and share in this presentation, please let me know via a comment on this post or via Twitter. 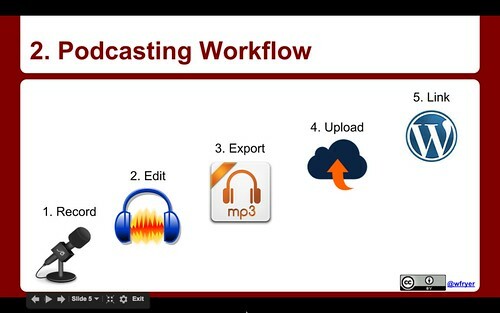 I created an image of the podcasting workflow slide, and added it to the “Radio Shows” page of ShowWithMedia.com. That page includes additional resources on podcasting / radio shows which may be helpful. Most of the icons I used are openly licensed on iconarchive.com. Most are linked in the Google Presentation to their source location. If your schedule permits, please join us for this free WordPress meetup in Edmond, Oklahoma, on Monday, July 27, 2015. You can RSVP on the Meeup website for the group.